Busy, busy, busy… that describes many Americans during the workday (and sometimes off-hours as well). Many jobs require us to be running from one place to another, or switching from one task to the next, at rapid speed. This type of lifestyle, day in and day out, can make it seem like there’s little time to breathe. However, this is exactly why it is imperative to make time to meditation, especially when you feel rushed. If you are constantly in “go mode” without giving yourself time to rest and regroup, you are actually doing yourself far more harm than good. First of all, chronic stress is terrible for your health. If you don’t take measures to manage your stress, it can lead to chronic inflammation and a host of resulting illnesses. Second, if you are constantly rushing, the quality of your work will likely suffer. You may get a larger quantity done but you’ll be more prone to make errors — which just leads to more stress, not to mention unhappy management. For these reasons, you have to treat unwinding time as an important part of your daily schedule. One great way to catch your breath, banish stress and center your mind is to regularly practice meditation. Don’t panic if you think you simply do not have room in your schedule; even five minutes of meditation can do a world of good. Meditating in the morning can set a zen tone for your entire workday, no matter how much you have on your plate. As soon as you get up in the morning, find a quiet place to sit. Bonus points if you can get outside on a nice day and meditate while basking in the sun. Focus on your breath and let each passing thought drift through you. Center. 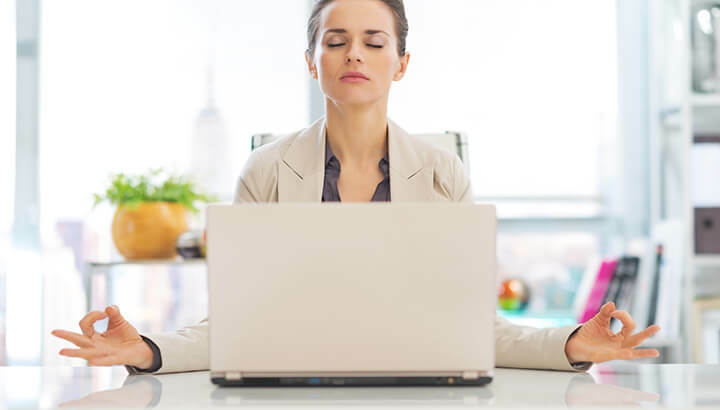 At least once during the busy workday, take five minutes to meditate. If you can, go outside or to a break room. If this is not a possibility, you can still meditate at your desk (or in a back room, depending on where you are working). Just sit back for five minutes, close your eyes and breathe. Let the stress of the day fall away and let go of worries of the work to come. When you open your eyes, you will feel much more ready to take on whatever challenges you are facing. 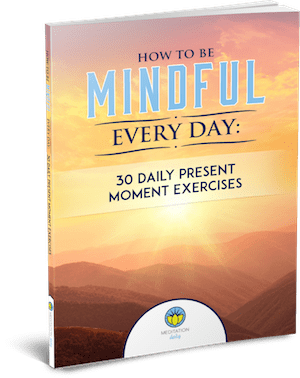 If you are able, take a five-minute meditation break more than once per workday, especially if you are finding yourself particularly stressed. When you get home from a busy workday, take some time to meditate before you jump into the evening’s tasks. Take your shoes off, put down the belongings you’ve carried home, say hi to your loved ones if they’re home, then find a quiet spot. Sit and meditate for at least five minutes (more if you need it), and allow your body, mind and spirit to regroup. This will not only make you feel calmer and more energized for the evening to come, it may also help you to be more uplifting to those around you. Meditating before bed is a great way to shed the worries of the workday and ease yourself into a restful sleep. This is also a great way to stop those churning thoughts which keep many of us up at night. If you’re feeling distracted by worries about tomorrow, tell these thoughts that they will be addressed tomorrow and let them go. If you practice this regularly, you may find yourself sleeping better and feeling more centered all around. Have you meditated yet today? If not, it may be high time for a five-minute meditation break. Should You Meditate During A Thunderstorm?